The Superior Double Rooms are commodious and ideal for 2 persons. They have all double bed and are equipped with a kitchenette, coffee machine, electric kettle, refrigerator, air conditioning (A/C), satellite TV, wireless Internet access free of charge and direct dial telephone. On the large balcony you can enjoy the beautiful sea view and garden. At Haris Apartments you will find everything you expect from a modern apartment. Our services and the friendly environment will make you feel at home, the comfort and functionality of the rooms and other amenities will provide moments of pure relaxation. 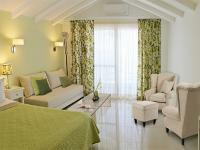 All rooms, family rooms and Suites have a large balcony with a beautiful view overlooking the Ionian Sea and the garden. You can enjoy your coffee, a drink and even your breakfast at your balcony watching the vast sea with the crystal waters. The Haris Apartments are located right next to the beautiful Vrachos-Loutsa beach in Preveza, Greece. We offer Suites, double,triple rooms accommodating 2-3 persons, and family rooms consisting of two separate interconnected rooms accommodating 3-4 persons, making them ideal for families with two children.